so I was under the impression that hot branding was now banned, but I recently found out from the R.S.P.C.A that it is NOT banned in N.S.W. so anyway freeze brands look better and are slightly less painful, but hot branding is a lot cheaper and quicker. who still fire brands their horses? who does their own freeze branding? 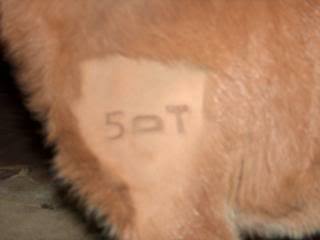 its just too expensive to have the vet freeze brand the foals every year and we're looking at other alternatives. Does anyone else do their own branding? Any tried and tested methods you can share? (send me priv msg if you prefer). I pay someone to hot brand mine. I dont like freeze brands as they look really ugly on a dark horse,all you have is this great white brand slapping you in the face.ima. This has got me thinking too. My brand is "Mini Size" so I don't think it would look any good as a hot brand because it would blur/run into each other. But the tanks for Liquid Nitrogen are so expensive! I am on the look out for a cheap one and then I'll decide whether the vet is doing the next lot of branding or what. My black stallion was freeze branded and it sticks out like a sore thumb its also a big brand. I have my own small stud brand and our local farrier has all the numbers and he comes out and fire brands all my ponies and i am quite happy with the results and it is a reasonable price. Have a mare with a freeze brand and agree it does stand out like a sore thumb but do have to admit you have no problem at all reading it whereas a fire brand if not done properly can be a real bugger to read. 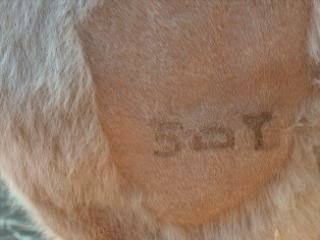 We brand all of our ponies and calves we use the smallest brand that is legal by W.A Agricultural Dep't It is about 30mm high X 140mm wide . We could not decide if we were going to freeze or hot brand. We thought that if we freeze then we could tell our foals from a distance at shows later if we weren't too sure... but on trying to get the liquid nitrogen ... it was just too hard ... Was told you can use dry ice instead but the supplier for that is almost 200 k's away... I was also told for freeze brand you have to hold it on for about 30 seconds ... So for convinience and being able to do it at any time we hot brand ... the brand does not meld together and the size is very readable and nice size for our mini's ... here is a pic of it on some of our different ponies . Do you have a furnace? Or how do you get the irons hot enough?? Yeah, unfortunately they made mine from the wrong metal (Stainless Steel!) and told me that's what they needed to be, but I later found out the truth. I'd be interested to see a photo of your set up if you can get one for me, I am having trouble working out a way to get a good heat going. Nan told me back in the day (lol you know her storys) that she used to hot brand the race horses before the freeze brands came in. She said she used half a 44 gallon drum,or one of those smaller oil drums with the top cut off. then you get a nice fire going in there and just leave them till they get red hot...could probably chuck petrol in there to get is going real good,too. everywhere else I have read (even though there is not much info on the subject), has said not to have them red hot, because that's when the brand "bleeds" and is more likely to cause ugly scarring. mine have always been done with a very very hot iron. I could put a pic up if you need to see it but it is just one of the round single burner gas BBQ"s that we also use when staying over night at shows or camping ... i have also used the normal gas top stove inside as we do most of the horses on the back porch... i don't know if it would get steel hot enough but if it burns into wood then it should be hot enough to brand (reheat after testing) ... I have seen some hot brands that has gone so deep there is no hair left and it was very clear the only way i can think of a brand not coming out clear is if it moves or the animal rubs and creates more of an injury from it being itchy ... we have had no trouble at all even though we have small brands . I have found the hotter the brand the less time you need to hold it there ??? Oh OK, thanks for that information. I guess the only bit I am unsure about is how you would place the brands on a gas barbecue to get them hot enough? Do you sit them on the grill part?? or in the flame bit?? Sorry if this is a stupid question, but I have only ever freeze branded! !